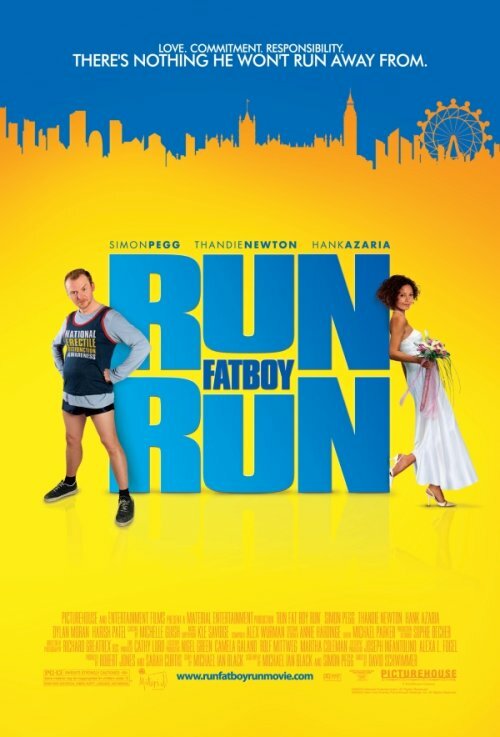 This poster for Run, Fatboy, Run makes me think of the poster for Superbad, not because of the similarities, but because of the differences. Superbad is a comedy without any well known stars in it. And yet the poster gets a lot of mileage by showing the main characters looking, at the same time, awkwardly funny and endearing. The pose the characters are in is important for this to work. They don’t look posed, they look natural. Which is one thing that distinguishes this poster from the typical comedy poster were you have the main actors with some exaggerated expression. The poster for Run, Fatboy, Run on the other hand center itself in the title, which is funny, but not that funny. And the characters themselves appear in the image interacting with the title, which is about the opposite of natural. This is not an unheard design for a comedy posters, but it isn’t a particularly strong one. And when coupled with this color scheme I think it makes the movie seem very light and overly silly. I did like the tagline tough. Made me laugh.